Amazon’s e-book strategy seems to consist of two parts: buy once and read anywhere (thanks to the company’s legion of Kindle apps) and push the Kindle—and Kindle editions of books—as much as humanly possible. The recently announced Kindle for the Web falls solidly in the latter portion of Amazon’s strategy. 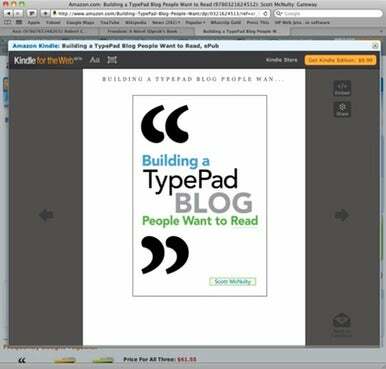 Kindle for the Web allows you to read the first chapter of any book that has a Kindle edition right in your browser. You can change font sizes, adjust the line spacing, determine how many words per line you’d like, and choose from three different color modes (white, sepia, and black). All these options should be familiar if you’ve used any of Amazon’s Kindle applications for almost every computer device under the sun (and for some that don’t even exist yet—I’m looking at you BlackBerry PlayBook). You can, of course, buy the Kindle edition of the book by clicking on the Get Kindle Edition button at the top of the window (to read the full book on your computer, however, you’ll need desktop software such as Kindle for Mac). The fun doesn’t stop there, though, because Amazon has baked in some social media goodies. You can share this preview with your friends via Twitter, Facebook, or e-mail. And you can even Embed a Kindle for the Web preview into your blog (or any Website that you can insert the embed code into). Check it out in action on author John Miller’s blog. All of this is very interesting for e-reader nerds like myself. However, the most interesting thing is how you access Kindle for the Web. When viewing the product page of a physical book that has a Kindle edition available, a green button appears labeled Kindle Edition. Click the Read First Chapter Free link and that book’s first chapter is displayed using Kindle for the Web. Although a similar button doesn’t appear on Kindle editions, you can still send sample chapters of Kindle books to either your Kindle device or Kindle app with a click of a button. Kindle for the Web is currently in beta, because that’s what the cool kids do, but Amazon promises future updates will include new features and better compatibility with mobile browsers. (Though chances are, if you have a phone with a browser capable of displaying Kindle for the Web, you can also download the native, and free, Kindle app for said phone).